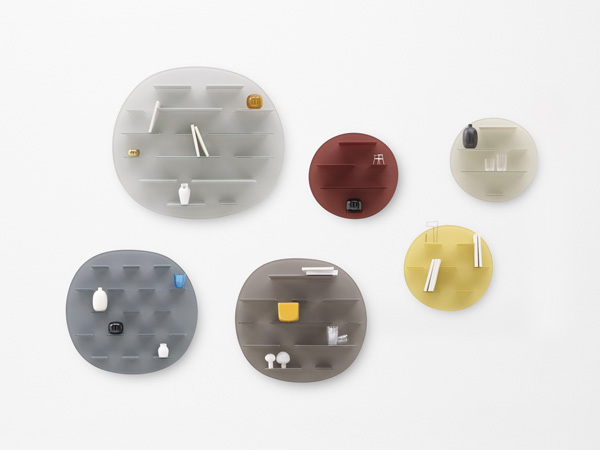 Italian and Japanese designers Luca Nichetto and Oki Sato of Nendo recently teamed up to create a brand new collection of products, which was launched at Milan Design Week. Inspired by a Japanese creative process in which one person starts a poem and then sends it to a second person to compose its ending, one designer sent ideas to the other, who concluded them, and vice versa. One of the pieces is a range of glass structures covered in tiny shelves. On their large, rounded pieces of glass, the shelves are like "speech bubbles floating in mid-air, the kind that appears by a manga character's head as he imagines something", says Nichetto. "Shelves that seem synchronised with the mind of their owner, once loaded with books and objects." WGSN-homebuildlife subscribers can read our full report on the art of display here.